The incredible history of the Cadillac brand had revolutionized and changed a cultural idealism of what an automobile is and could be. We need to re-imagine and move forward rather than backwards. Same is true of the way in which the consumer interacts with a brand. You need to engage the consumer in the participation of the brand. We believe in combining strategic vision, engaging creative, innovative technology and flawless delivery to give Cadillac end-to-end solutions. Helping to connect consumers on the show floor to the brand. Activate unused real estate on the show room floor to engage attendees. Communicate and generate consistent architectural brand expression that is in line with the current brand positioning of Cadillac. Extend Cadillac's positive experiences to the motor show exhibit space. Engage the customer in a memorable, share-able and measurable way. Maximize engagment time through on-going social communication. We have no new product stories to tell..so how do we generate buzz and energy for the brand? The following are experiential activation's that seek to generate brand stories and excitement for Cadillac; that will drive people to the space, increase media coverage and help manifest the year's communication in an EPIC way. Let's generate our own press stories. Do something a little Daring. Different. We are proposing a progression of experiences that will guide the press and the public into momentous activation that extend beyond the auto show floor. We know it has to be BIG, inspirational and indelible-keep the momentum going for Cadillac. In line with stories that are being told on the Dare Greatly website we will run in parallel with the content. While space planning and activating the environment; we thread consistency through all of the touch points of an experience. We tap into the 5 senses through the use of; language visuals, motion, spatial cues, sensors and surprises. With the end goal in mind to entice the audience and create an interaction moment with the brand-that transcends the over saturated auto show landscape. We design and thread out interactive strategy with the following components to create a visceral experience. Recommend alignment with Cadillac's AOR's in order to maximize audience attention and capitalize on efficiences. Driving people to the space to entice through social media applications, create first touch points, extend the experience, and measure successes. All proposed concepts are threaded with pre, during, and post integration. We propose to tell stories that are in-line to your current brand language. 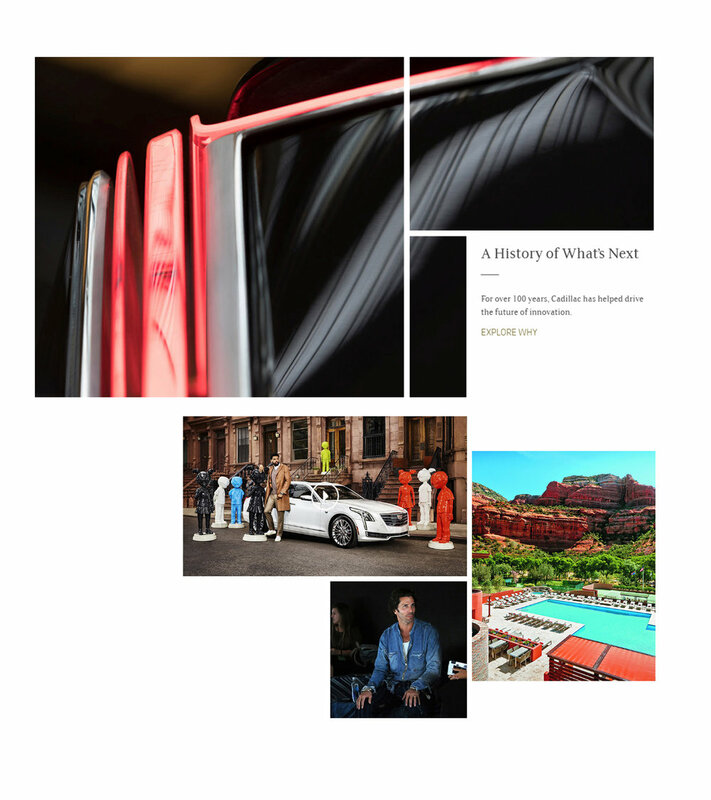 Highlight people and things that push the boundaries of "normal" These stories appeal to the emotional essence of Cadillac and will help the attendee connect to the brand on the showroom floor. Highlight the Retail Lab at Cadillac Brand House; in partnership with the CFDA, by offering exclusive behind the scenes from designers highlighted in the Retail Lab like Timo Weiland. Show exclusive behind the scenes work and design process, creation of collection, and runway exclusive footage. Collection can be showcased on the show room floor. PRE: Create build up of exclusive content through media outlets including Cadillac, and designers. DURING: Create anticipation by having designers sign limited edition prints of their sketches. POST: allow Cadillac enthusiastic opportunity to see content after show closes, ability to live on micro site and play within the Retail Lab in NYC. Let’s celebrate those that have Dared Greatly in their Community. Individuals that stand out in their disciple by their unwillingness to conform and their strong willed passion to challenge convention. Let’s bring them to life in our space. Dare Greatly Influencer’s for consideration that have impacted New York City and beyond; Casey Nestat (youtube vlogger, and film maker), Grace Coddington (former Creative Director of Vogue), Sophia Amoruso (Creative Entrepreneur CEO of Nastly Gal), Raf Simons (Creative Director of Calvin Klein). Host TED like talks on the show room space in the Oculus Gallery with the Dare Greatly Influencer’s. Audience members can share their Cadillac Story. PRE: Allow the makers and creative influencer’s create curated content sponsored by Cadillac. Host a campaign that is centered around how these influencer’s have dared greatly. Allow opportunity for fan meet and greets in the space. Attendees can share their dare greatly moment on social sites. DURING: Attendees will have the opportunity to hear Dare Greatly Influencer’s stories in the Cadillac space or on-line. Enthusiasts will have the opportunity to sign up for a meet and greet with the Influencer. Live performance Art is an immersive experience, the act of watching an artist create is transfixing. Raw, Pure and full of passion. You can not contain the energy of a artist. At the Cadillac Space- watch as the space visual transforms live. Commission artist Alexa Meade best known for her urban art of painting live models and scenery to take to the Cadillac Space, creating work inspired by Cadillac’s monumental contribution to design during its 114 year old rein and raise back to the top, with a focus on architectural backdrops and fashion of the era. PRE: Curated content of Alexa working shared on social media. Stage her working near or around Cadillac’s. DURING: Attendees will be able to see Alexa working to create historical moments in history of Cadillac including architectural and fashion. Work will be time lapsed and documented for social use. POST: Cadillac Enthusiastic will be able to watch time lapse work of Alexa. Work displayed in the Cadillac Magazine and on social platforms. Imagine being able to impact the future of Cadillac. A futuristic interpretation of the Cadillac brand. Inspired by the future of Cadillac visually represented an interactive, immerse environment. Attendees are able to explore the futuristic offerings of Cadillac by experiencing an urban modern landscape. Composed of LED flooring that is responsive, infinity art mirrors that reveal messaging, and walls that respond to body temperature the immerse landscape unfolds its self to the attendee. Attendees also receive a sneak peek of upcoming form language changes to the entire fleet. Press conference regarding all the new technologies available on Cadillac's. PRE: Tease leeks of the new futuristic Cadillac through social media. DURING: Invite Cadillac Enthusiastic first antecedence during Press days to see the Future of Cadillac. POST: Filmed digital content of the experience can live on daregreatly.com, allowing Cadillac Enthusiasts who were not able to make it to the show the ability to participate in the demonstration. A deep dive into the BOOK by Cadillac program. PRE: Curated content of current BOOK members alluding to the on-site registration program to win a local date night, and curated luxury trip. DURING: Attendees will be able to learn about the BOOK by Cadillac program on site through use of compelling video, and graphics. Attendees who sign up for more information are registered to win for the local date night and the ultimate grand prize. POST: Cadillac Enthusiastic will have the opportunity to hear real testimonials of the soft launch program in each city; and follow along with the winners to see how a Cadillac and BOOK by Cadillac transforms the way you own a vehicle. Interactive sculptures placed around the city of Detroit, highlighting Cadillac’s commitment to design contributions to the city. Unexpected, cutting edge spaces designed to immerse cultural progressives and Cadillac Enthusiasts, and draw attention, and create a free community gathering space. Placed around Detroit, the Cadillac Pavilions will act as a bug light to highlight Cadillac’s commitment to the community, and the arts. Visually cuing to the architecture of the auto show with a call to action to visit the Auto Show and see first hand Cadillac’s commitment to Design, Craftsmanship, Technology and Performance. Brand Ambassadors engage attendees and answer any questions. PRE: Block off for the build of pavilion, create a micro-site for interested people to investigate. Create curated content that nods to what is happening, inspiring shots of the vehicle, renderings of the pavilions. Community reach with focused messaging. for activations. Content will be captured for sharing. POST: Cadillac Pavilion Interviews will be shared on social media outlets and on daregreatly.com, featured design of pavilions will be shared on Cadillac Magazine. An interactive focused on relieving stress. Attendees will have the opportunity to spend time with the Cadillac Cats. By registering prior to the event, it will guarantee a spot in the Cadillac Cat Cafe. A free LYFT- to and from COBO in a Cadillac. Team up with LYFT to create a seamless Ride and Drive for Auto Show Attendees. Offer free drop off to their vehicle. Have the hospitality tell an interesting and compelling story. What if the Cadillac Hospitality featured Detroit(such as corn dogs or mini chili dogs) or New York City (Epic Tap Milkshakes) or reveled the personality of the vehicle in food? Identify unique story telling opportunities through food and beverage.